Established in 1952, Redwood Parents Nursery School (RPNS) is a non-profit, parent-education, cooperative preschool in Redwood City. At RPNS, children have an opportunity to learn through play with a broad selection of hands-on experiences and materials. The children participate in large group, small group, and free play activities with an emphasis on free play. We strive to provide a place where children develop their self-esteem as they participate in an environment that encourages and respects their independence and capabilities in physical, social, and emotional development. We believe this is the foundation for personal success and academic achievement in years to come. RPNS offers children a stimulating and unique place to begin their educational experience. It also offers parents the opportunity to learn a great deal about parenting styles and early childhood development. and share their observations of the children. 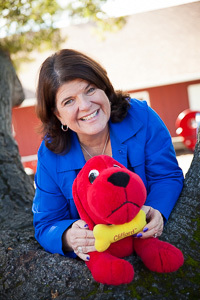 Margie graduated from California State University, Chico with a Bachelor of Science in Business Management. She earned her Early Childhood Education Certificate in 1993 and holds a California State Adult Education Teaching Credential in Parent Education. In 1987, the Lawson family joined the membership of RPNS with their children Joe and Kate and Margie sat of the Board of Directors as 3rd VP Membership. Margie’s experience as a parent at RPNS, along with the encouragement of former teacher, director and mentor Janet Cocconi, lead her back to school to earn her Early Childhood Credential. In 1990, Margie joined the RPNS staff as teacher and over the past 25 years has taught the Toddlers, Twos and Pre-K Classes. In 1998, she became Director of RPNS. This summer Margie and her husband Rich experienced the wonderful joy of seeing their son Joe marry the love of his life Debbie. Their daughter Kate is living in Redwood City with her daughter Aubriana who is also an alumni of RPNS. Margie’s special joy in life is being a grandmother and has high hopes for many more to come! Margie enjoys spending time with her family and friends and loves to travel. She is a die heart Forty-Niners and Giants fan and loves attending their games. Margie is enthusiastically looking forward to this year with you and your child. Kathy graduated from the University of California, Davis with a Bachelor of Science in Human Development and Biology. Kathy also received her California State Multiple Subject Teaching Credential from UC Davis and holds a California State Adult Education Teaching Credential. Prior to joining RPNS as our Mixed Ages teacher in 2000, Kathy was Director and Kindergarten teacher at a private school in San Mateo. Kathy has always been actively involved in San Mateo County, promoting quality childcare and participating in educational workshops. Kathy and her husband, Carl, live in San Carlos and have three children, Alyssa, Jennifer and Matthew. Her daughters have graduated from college and her son is in his senior year at the University of Oregon. In her spare time, Kathy enjoys sporting events, shopping, reading and spending time with her family and friends. Kathy has always loved working with young children and looks forward to beginning her sixteenth year at RPNS with the Three’s class. 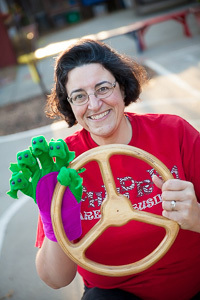 Andi holds a Master’s degree in Education from the University of Connecticut Graduate School with emphasis in Therapeutic Recreation. 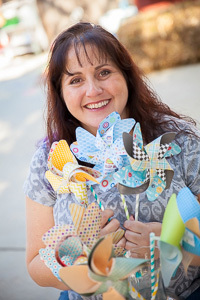 Andi spent seven years working as a Recreational Therapist at Stanford Children’s Hospital, and has been working with children for more than 26 years. She earned her Early Childhood Education Certificate in 1994, and holds a California State Teaching Credential in Parent Education, as well as a Child Development Site Supervisor Permit. Andi was the Director and Toddler Teacher at Woodside Parent’s Nursery School for over five years. She volunteered countless hours at Sequoia High School on the PTSA over 6 years. She is a proud recipient of the 2014 RPNS Betty Strombom Award. Andi and her husband, Volker, share their Redwood City home with a rescued dog named Bailey. Their daughter will be graduating from UCLA in June, and their son is a sophomore at Foothill College. She enjoys gardening, cooking, crafts, nature hikes, and reading. Andi is looking forward to her 11th amazing year at RPNS filled with the joy and wonder of learning along with her toddlers, twos, and RPNS families. Donna received here Early Childhood Education Certificate from Canada College in 1996, while working at Woodside Parents Nursery School. From 2000-2007 she worked at Notre Dame High School in Belmont while her daughters attended there. She has 2 daughters who attended RPNS from 1988-1991, Amanda, her oldest daughter, graduated from Arizona State and is living in Half Moon Bay with her husband Anthony and new baby son. Her younger daughter Katelyn is pursuing her nursing degree and is living in Fresno with her husband Ryan. Donna also has 2 step daughters and 8 darling grand children. Donna loves working with young children and their parents. For fun she enjoys camping and hiking with her family, softball, golf, skiing and riding her horse Dolly. 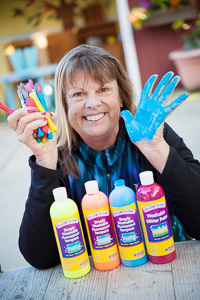 Teacher Donna is our resident gardener and creator of the Children’s Rainbow Garden. Carina graduated from San Diego State University with a Bachelors of Science in Child and Family Development. She then completed her Masters of Arts in Counseling Psychology from the College of Notre Dame in Belmont. During her college years she worked with all ages of children. She has experience working with school age children in an after school program, as well as, working as an Assistant Director at La Mesa Early Learning Center. Once she enrolled her oldest child in RPNS, she realized that the co-op environment was exactly what she wanted for her child. Carina owned a retail scrapbooking store in downtown San Carlos for 8 years. When her second child came around, she wanted her daughter to also attend RPNS. Since her two children are older and her business was closed, Carina has been an Assistant Teacher at RPNS in the Two’s and Three’s classes for the last three years. She loves scrapbooking and being crafty in general. Carina loves being a part of such a dynamic teaching staff. 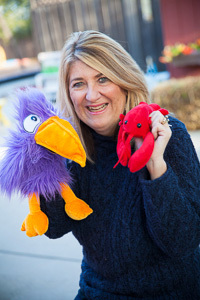 Paula has worked with children for 29 years. She has been a Kindergarten teacher and developed a K-8 school music program for an entire private school. She has also taught a music program to 160 students at Roy Cloud Elementary School for 9 years. 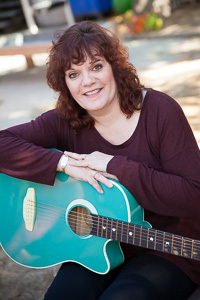 Paula has a Child Development Credential and has taken graduate level music education courses. After working at Bright Horizons @ Gilead for almost 3 years, Paula eagerly accepted the job as assistant teacher for the Pre-K class. Paula has experience with RPNS since she taught Music and Movement to Teacher’s Kathy’s Three’s class for two years and both her children are alumni of RPNS. Paula lives in Redwood City with her husband Louie, son Niko (22 years old) and daughter Mariah (17 years old). She loves spending time with her family and teaching children. Paula looks forward to working with the RPNS staff and all the children. We will enjoy a positive learning experience together! It is our concern that this program contributes in a vital way to the optimum growth and development of each child; that each parent find understanding and support for self; increased knowledge and understanding about the way children grow and develop; and opprtunity to test and practice some of these ideas.